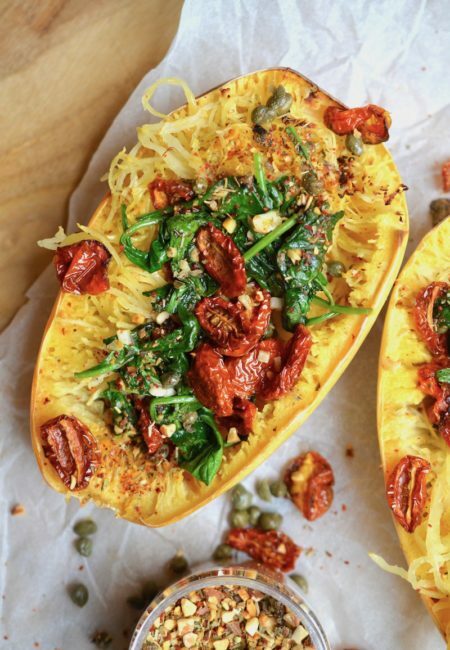 Spaghetti Squash doesn’t get as much attention as I believe it deserves. If you’ve never made spaghetti squash you are probably wondering if it really IS like spaghetti. Well, yes, and no. Once baked and tender, the strands are long and stringy as you scrape a fork across the flesh of the squash. They are long and spaghetti-like but a bit more delicate than pasta – and of course, it is a vegetable after all, not an actual noodle made from flour. The flavor is sweet and earthy, especially when it is rubbed with olive oil, seasoned with sea salt, and roasted in a hot oven. I like to roast them face side up so the edges of the open squash get a bit brown and caramelized. Once it is cooked and tender, the stands just tenderly pull apart to create a deliciously stringy base for flavorful toppings. Some like to treat this bright yellow squash like real spaghetti and top it with marinara sauce but I prefer to top it with flavorful and colorful veggies and then top that with toasty breadcrumbs and the nutty Italian flavors of our Umbria nut & spice mix. The chopped almonds, rosemary, aleppo peppers and sundried tomatoes give this dish a robust and tangy flavor. This is one vegetarian meal you just can’t get enough of. Each half squash makes one serving but we found ourselves scraping to the bottom of the cavity to get every last morsel. The capers added a nice vinegar tang to counterbalance the rich roasted tomatoes. I also loved the crunchy breadcrumb & Umbria blend topping which gave it a wonderful and textural crunch. This is definitely a recipe to repeat over and over. Slice the grape tomatoes lengthwise, spread them onto a parchment lined baking sheet, drizzle with olive oil & sea salt and place them into a 350° oven to roast for about 15 minutes. Check after 15 minutes, some may be a bit crispy but do not let them burn. Remove from the oven as soon as they are browned a bit but not completely dry. Allow them to cool completely. Heat a sauté pan on the stove top, add 2 teaspoons of olive oil to the bottom, then add the panko bread crumbs, a pinch of salt, 2 teaspoons of Umbria nut & spice mix and stir over the heat until they lightly toast. Remove from the heat, allow to cool a bit, then add the shredded parmesan, toss and set aside to use as a topping over the prepared spaghetti squash. Take the spaghetti squash and place in the microwave for about 2-3 minutes to soften the flesh enough to slice through with a large chef's knife. When it is cooled a bit from the microwave, slice it lengthwise into two pieces. Clean the seeds out of the cavity (hint: I always use a grapefruit spoon which has serrated edges and it helps with the scraping). Using your hands, rub the inside cavity with a drizzle of olive oil and rub it well. Sprinkle the inside cavity with a bit of sea salt and a bit of Umbria nut & spice mix. Place the squash face up on a baking sheet and bake in a 400° oven for about 20-30 minutes. Remove and allow it to cool a bit. Scrape the inside to loosen the strands of squash but leave them in the squash cavity. In a saucepan, add a bit of olive oil & heat through. Add the minced garlic and cook a bit without burning. Add the fresh spinach, the capers, about 2-3 teaspoons of the caper liquid and a sprinkle of Umbria nut & spice mix. Add the roasted tomatoes which were set aside. Remove from heat and mix well. Toss the tomato/spinach mixture into the cavity of the spaghetti squash, top with the crunchy panko crumb mixture, a bit more of Umbria nut & spice mix, and serve. This only serves 2 persons but can be doubled or tripled to serve 4-6. Enjoy!